Boutique style hotel offering quality accommodation in Tarbert on the Isle of Harris. 20 ensuite bedrooms (single, double, twin, family & king size rooms). All with direct dial telephone, CD/DVD player, Freeview flat screen TV, free wi-fi, tea /coffee, hairdryer, toiletries. Deluxe rooms also have mini bar & ipod/MP3 docking station. Room service. Laundry service. New restaurant and cosy lounge bar. Dinner, B&B packages include Romantic Breaks and Girls Weekend Away (with champagne, flowers, truffles). Special breaks can include boat trips to St Kilda or the Shiant Islands. Set in private grounds by Loch Snizort, north Skye, with its own 9-hole (18 tee) golf course. Victorian hunting lodge refurbished to a high boutique-style standard. 14 bedrooms & suites including four-poster rooms. Cosy lounges with open fires. Restaurant, lounge bar & conservatory. Fishing, golf, sailing. 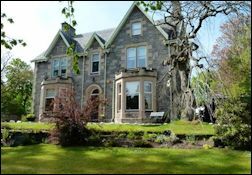 Scottish Tourist Board 4 Star Small Hotel in Grantown on Spey. 13 miles from Aviemore. 35 miles south of Inverness. Personally run hotel with intimate atmosphere, renowned for its warm hospitality. Recommended in Alastair Sawday's Special Places to Stay, The Good Hotel Guide 2019, Britain's Finest, Scottish Food Guide and Karen Brown. 6 spacious luxury ensuite bedrooms. Ideal for romantic breaks or special celebrations. Award-winning fine dining. AA Red Rosette. Whisky Tasting weekends.